After using my Perfect Push Up's for a few months I am very satisfied with them. Before I had the Perfect Push Up I was still quite good at push ups but was able to do 70+ push ups; which is too many if you want to be building muscle. The Perfect Push Up helped make my push ups much more challenging. It takes your push ups to the next level by working different muscle groups and rotating the rotating the wrists. The Perfect Push Up includes a very nice laminated work out schedule that is very well planned out. The calendar outlines an easy to follow chest and arms workout. It starts out by having you do as many push ups as you can, and then tells you the optimal number of repetitions to do in each of your sets based on you max. The calender then shows which days to do what types of push ups as well as schedules rest days. Additionally the back side of the workout guide has diagrams that show correct form for a number of different variations of push ups. The ball bearing movement on the Perfect Push Up is very smooth, and the hand grips are coated with a softer rubber. Overall sturdy and well constructed. Below you will find a video of someone explaining the differences between the Perfect Push Up and Push Up Pro. 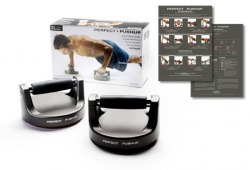 Basically the Perfect Push Up is nice than the Push Up Pro, but also slightly more expensive. About $45 vs. $30, but in my opinion it is money well spent. The company who manufactures Perfect Push Up also has excellent customer service. When I misplaced my laminated workout calendar, I called to order another. The were very friendly on the phone and sent me a new one at no charge via FedEx. I was very impressed!